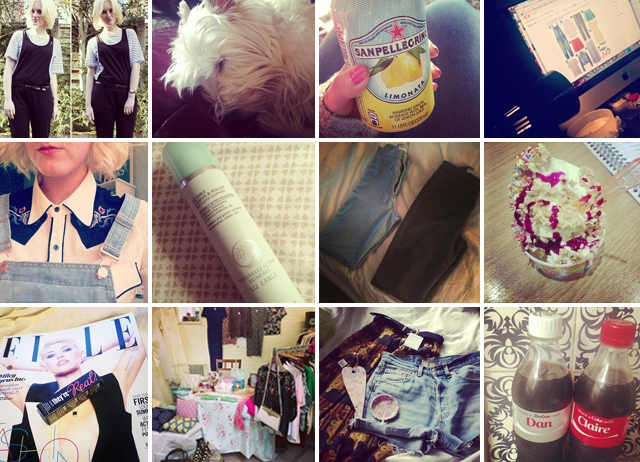 Outfit photos on the blog | Sleepy pooch | One of my favourite summer drinks | Blogging! | Gorgeous Fashion Union blouse with Primark dungarees | Always go back to me holy grail Liz Earle cleanser | Selling my American Apparel Easy Jeans, both size small if anyone’s intereste! | Ice cream van visited work | Jupmed on the Elle / Benefit bandwagon | My stall at the St Catherine’s Hospice Vintage Fair | Little haul from the Vintage Fair | Don’t even drink coke but had to get these just for the bottles! "LA ROCHE-POSAY EFFACLAR SKINCARE REVIEW"
That ice cream looks huge! Could definitely devour it round about now though. I spotted the 'named' coke bottles in town today too, but couldn't find mine! OMG those jeans are amazing, how much are you selling them for? !